A solderless connection, enlarged 15 times. Connections are more uniform than soldered ones and only half as bulky. For years the accepted way to connect wires to telephone apparatus was with solder. 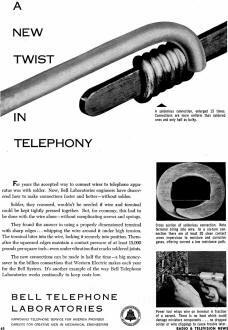 Now, Bell Laboratories engineers have discovered how to make connections faster and better - without solder. Solder, they reasoned, wouldn't be needed if wire and terminal could be kept tightly pressed together. But, for economy, this had to be done with the wire alone - without complicating screws and springs. They found the answer in using a properly dimensioned terminal with sharp edges ... whipping the wire around it under high tension. The terminal bites into the wire, locking it securely into position. Thereafter the squeezed edges maintain a contact pressure of at least 15,000 pounds per square inch - even under vibration that cracks soldered joints. The new connections can be made in half the time - a big money-saver in the billion connections that Western Electric makes each year for the Bell System. 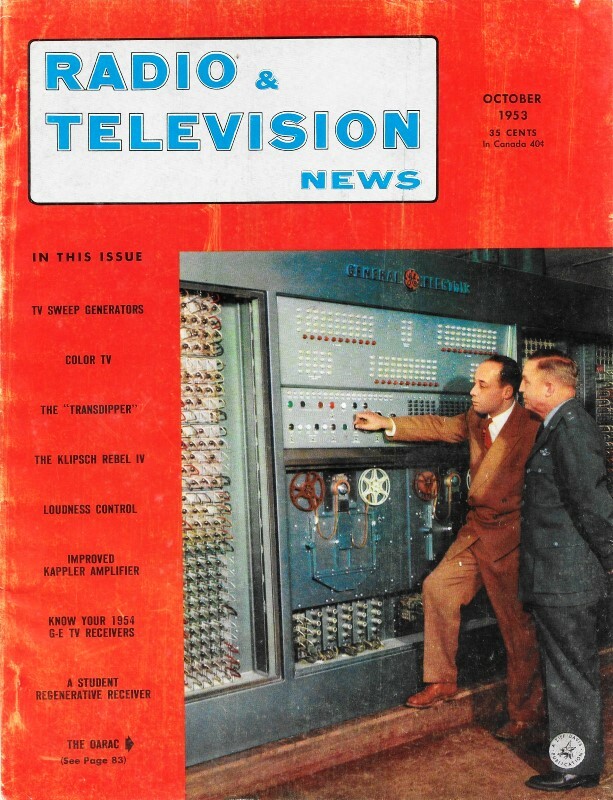 It's another example of the way Bell Telephone Laboratories works continually to keep costs low. Cross section of solderless connection. Note terminal biting into wire. In a six-turn connection there are at least 20 clean contact areas impervious to moisture and corrosive gases, offering current a low resistance path. Power tool whips wire on terminal in fraction of a second. There is no heat which could damage miniature components ... no dropped solder or wire clippings to cause trouble later.